...including shops, restaurants, nurseries, churches and interiors. 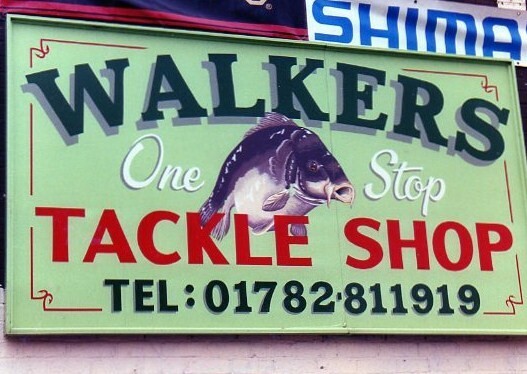 This shop belongs to Mark & Justine, and has sported this look now for some time. Not that I could take much credit for it as, the owners are very particular about design, colour & layout etc. 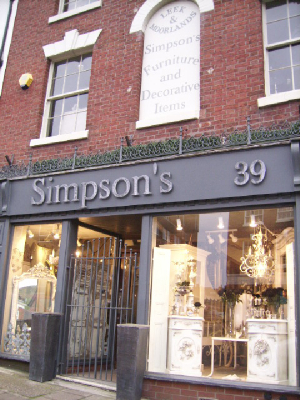 Attention to detail extends throughout their stylish business of floristry and antique/distressed furniture. The lettering and numerals were jigsawed out of marine plywood, and oil-primed for protection. I attached them to the board on-site using brass screws & spacers, then completely clad them in lead roof-flashing (this was my own original idea). The fascias were all originally painted matt in a light stone colour, (same as the arch-topped sign above which I also supplied) but have since been repainted in slate grey which I think - used alongside the lead - was inspired. However, when it comes to personal taste it doesn't really matter what I think. I try to visualise and realise exactly what my customers require. Whether they provide detailed info, drawings, or wish me to provide more of the design input. 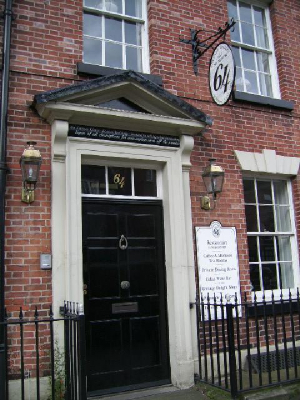 Simpsons (above, and to whom I am very grateful) recommended me to the owners of 'No.64' to supply the signage to their recently acquired and completely refurbished three storey 'Georgian townhouse' premises just a few metres down the road. 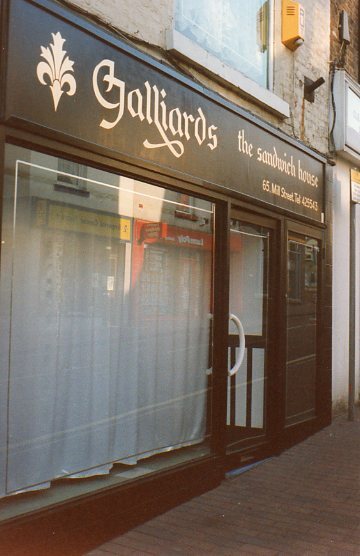 It was to be a restaurant, patisserie, tearoom, shop, cellar-winebar and eventually I think a b&b. My job entailed: Supply & fit of wrought iron hanging sign, wooden wall sign and several polished oak hand lettered interior door plaques for each room. The numeral 64 was glass gilded using a traditional technique on the middle pane above the front door. Above that, a 'sale of alcohol' legal notice was hand-done in 'copperplate script' style. For the pavement I supplied a 'posh' taller than normal A' board which I built strongly and well finished-off, complete with polished brass hinges and the 'Cottage Delight at No.64' emblem protruding in relief over the top. I also painted a couple of things in acrylic on the interior walls, including a grapevine illustration with arrow pointing downstairs to the cellar-winebar. 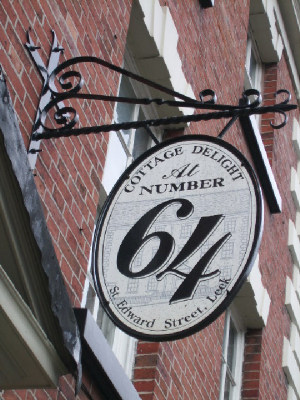 Cottage Delight are still a thriving company producing speciality foods but sadly the ambitious No.64 recently had to close down. After being given the oval No.64 design, I drew a sketch of what I thought the sign could look like. It was quite rough but I managed to communicate the idea to the boss who told me to go ahead and make it. I then approached 'Izaac Walton Smithy' now of Swynnerton, to fabricate the sign in wrought iron, which they did brilliantly. I received it in its bare-metal state and treated, primed & coated it with specialist paint. 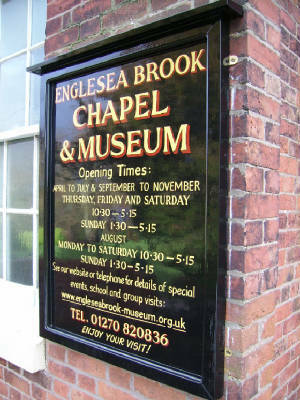 Then I executed the signwriting in black & grey enamel. Finally I fixed the heavy sign to the brickwork with steel nuts & bolts set into holes using a two-part chemical adhesive. Some may think that the type of attention to detail I have shown on these jobs is unnecessary. I don't buy this as, most of the proprietors I meet are very exacting. Even when cost is invariably a major factor, I try to give people what is asked for and hopefully, satisfaction. 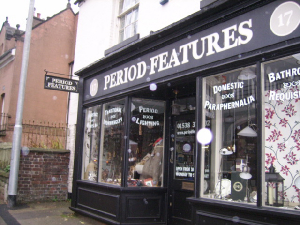 Period Features is situated just around the corner from No.64. and although my involvement wasn't the result of a recommendation. When I informed the proprietress - Lucie Storrs - of the other work I'd done close by, she hired me straight away (nothing to do with the fact that I already knew her partner Pete). Part of the business here deals in antique fixtures & fittings, so I was easily supplied with a rotten and bent up old Post Office swingsign to resurrect. After I'd made a new wooden sign to fit the once straightened bracket, I painted it including all the exterior signwriting with 'Farrow & Ball' matt exterior paints which retail at the shop itself. It's difficult to see from my poor photo that two subtle colour tones were used on the exterior lettering to add to the Victorian feel to the fascia. Lastly, all the lettering on the glass I supplied in vinyl and fitted to the back of the glass in reverse, to read correctly when viewed from the street. Construction and painting of all exterior signs is substantial. Exterior plywood board of 12 or 18mm is glued and nailed into a routed-out recess in a soft or hardwood, profiled frame. All corners are precision mitred, glued and held with large screws. Paintwork usually consists of two coats of oil based primer, any filling and flatting-back are carried out where necessary, one undercoat and two coats of high quality gloss. This particular sign has a hardwood frame and the addition of its own protruding sloped roof for shedding water and so prolonging the look and life of the sign. Old English style lettering in 23 carat gold leaf on matt black background. Not my vision, just acting under instructions from a talented designer. The gilding was probably my - usual - recommendation. Gold metallic paints tend to blacken in time, whereas real gold withstands the elements and never tarnishes ever. It is so thin and goes so far but the cost of gold leaf fluctuates. However, it may be less expensive than you would expect so, please ask! 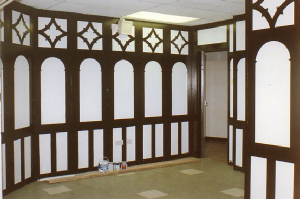 All the white interior walls were marked out in pencil, the black then painted in using large signwriting brushes. 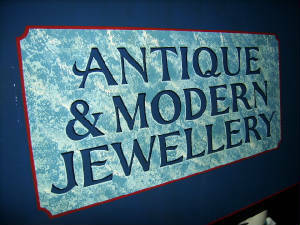 P. T. Miles is a long established Jewellers situated in Newcastle U Lyme. The old and now perished sign had been supplied by another local tradesman. The owner wanted the new sign to be virtually identical to the old one and asked me to do the work. I gilded the main title in 23 ct gold leaf and added a red outline. A block shadow was added in black and, the gold was varnished. Two painted panels were added to the space at either side of the title, the outlines of which were masked out. 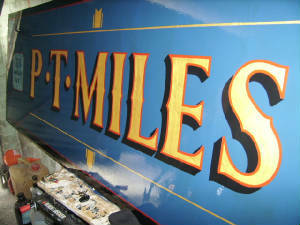 Masking of letters for both panels were then set out, cut by hand and applied to the surface which was then painted light blue. A sponge was then used to apply a lighter blue random patterned finish then, more sparsely the same in dabs of white. When dry the masking was removed and red outline added. Highlights and shadow added to make the letters appear as if carved into the surface revealing the blue beneath completed the effect. 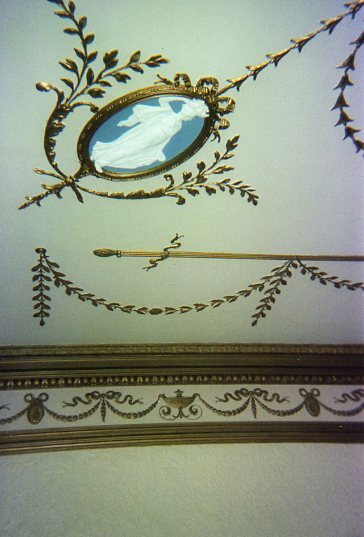 The white figurine on blue cameo ceiling decorations are a clue to the past family connections to this large and grand country residence in Moddershall. That's right, it was Wedgwood. I was also told that some of the exotic flora in the garden had been put there by Charles Darwin himself. I was asked to make surface repairs to cracks in two ceilings. One - the largest - was covered in cracks and, as any decorator or restorer will know, the best way to repair a crack is by first making it bigger - which I did. To be then filled and sanded. Both ceilings repainted completely, gold detail painting to endless amounts of plaster relief work and repainting the cameos, all this ended up taking about a week. 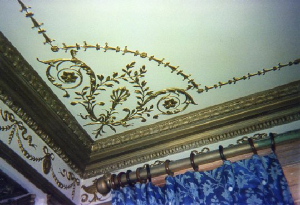 To be done by proffessional restorers, this work would have cost several thousand pounds. I did a good impression for a fraction of this, my efforts had been considerable and I was very pleased with the final result. However....after somebody's demeaning attack on my efforts, a roof raising argument and wiping that somebody's saliva from my face (fired at point blank range), I went home shaking with rage and the extremely bitter memory of the experience eats me still as I write. All the jobs I do are tackled with confidence and, I am often my own harshest critic. If I say I can do it, I can do it and have stretched my abilities and resources many times to complete a job well. 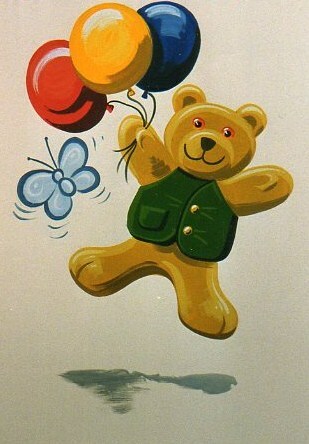 And finally, for Little Treasures Day Nursery, a floating ted!